JRTC Intern, in association with LawSikho.com and iPleaders, will be holding the first annual career development summit for law students. The summit will consist of a seminar and panel discussion series. Hon'ble Mr. Justice K.G. 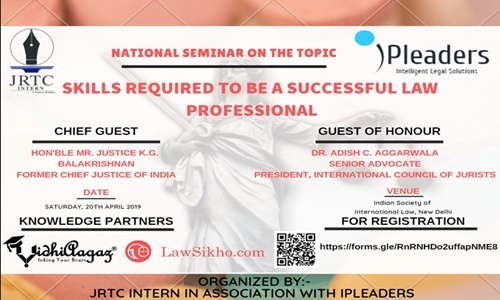 Balakrishnan, former Chief Justice of India, will preside over the seminar as the Chief Guest & Key Note Speaker and Dr. Adish C Agarwalla, Senior Advocate, President International Council of Jurists, will be the Guest of Honour. Interested people are required to register here. Queries can be addressed to Deepak Khandelwal [deepak@jrtcintern.com; +91- 8651718126] and Pratyush Singh [+91-9911139696].